It must be a difficult time to be an automotive spokesmodel. I'm sure it is in New York City as they are in the midst of their annual show this week. The New York Times is reporting some of the tribulations models have incurred while trying to showcase new products at Chrysler and General Motors displays. I attended the Detroit Auto Show last January, two public days and one supplier day, but heard no heckling from the Michigan crowds. 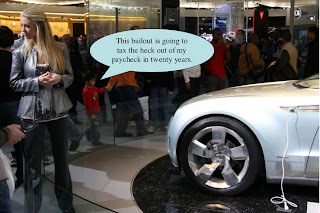 Not that it didn't happen, but for some reason it doesn't surprise me in a climate of a new round of bailouts, rising unemployment, and an always opinionated New York population, GM and Chrysler are finding some strange outbursts from show visitors. My personal favorite, "One G.M. presenter said a woman told her the company was responsible for the death of American soldiers in Iraq. The logic went like this: if G.M. made more fuel-efficient cars, the country would not need so much oil, and if the country did not need oil, United States troops would never have invaded." Yeah, I don't think people like this "woman" really understand the costs of electric vehicles, their unproven long-term durability, and the mass consumption of electric cars it would take to significantly reduce our dependance on foreign oil." Oh well, I do feel sorry for the attractive women and men having to market the products at the show this year. Maybe GM should just have Bob Lutz be the spokesmodel, while Chrysler's Jim Press crouches behind a Fiat 500?